We were asked after publishing issue 319 why MAPS.ME was marked as non-free software. MAPS.ME is not free software because it contains Code2000 font which is a shareware. We mark a software as free software if all its parts are free software as defined by Debian Free Software Guidelines. Johan Gyllenspetz of Mapillary, tweets about their new filter function for traffic signs. Jochen Topf blogs about a service that Martin Raifer created to show the history of tags in nice graphs. Some more background in a diary entry from Martin. Matthijs Melissen has already used this to find some interesting statistics. On the Tagging mailing list, Martin Koppenhaofer initiates a discussion on the tagging of the BND (the German intelligence service) in Bad Aibling. He points out that landuse = military doesn’t fit and suggests alternatives. Swiss OSM community discusses, in the Talk-ch mailing list, whether they should map postal code polygons (as boundary relations) similar to what happened in Germany. User Nammala from Mapbox updates about progress of reviewing navigation data in Germany in the OSM forum and diary. This year, for the first time in history of OpenStreetMap, there is a preparation for the OpenStreetMap Awards, they will be presented this September at the State of the Map 2016 in Brussels. Don’t forget to vote for your favourites! Anyone who is registered at OSM may participate. So you are! Please vote. On the OSM-Talk mailing list, Matthijs Melissa proposed to replace the wiki page Map Features with an automatically generated version from Taginfo. Martin Raifer has visualized the information of anonymized and simplified log-files of OSMF Tileserver provided by the OSMF. Greg shares his idea to import trigonometric points in OSM in the Talk-gb mailing list. Brian Prangle communicates in the talk-GB mailing list informing that the statutes of the OpenStreetMap UK Community Interest Company has been reviewed by solicitors. Geofabrik invites everyone to be a part of the hack weekend on 29th and 30th October in Karlsruhe. We are going to have two continental State of the Map conferences: in Asia and Latin America. The State of the Map Asia will take place in Manila, Philippines, on October 1st and 2nd. The program schedule will be published soon. SB 79 advertises the Elbe-Labe Meeting which takes place from October 7th to 9th in Dresden. Register before September 14 to get a T-shirt. Submit your scholarship application for SotM Asia. Microsoft and Mapzen have built a Augmented reality app which is a navigation system for visually impaired people. It was presented at the SotM-US as well. The Newton hurricane struck the area of Southern California. Tasking Manager has been made to facilitate mapping by the community. The red zone is the priority area. The whole area is poorly mapped, so the challenge is strong! Please help map! Mapswipe was probably used with success in Myanmar. 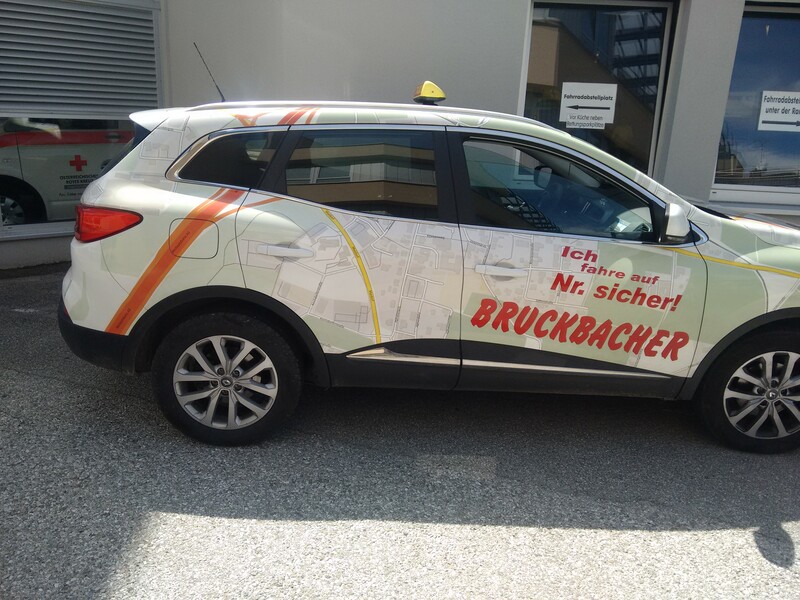 The Austrian Taxi company Bruckbacher advertises its regional knowledge and therefore painted (automatic translation) a huge OSM map on one of its cars. E-Healths-COM reported about the project Carus-Navigator by a group of students from Dresdner Marie-Curie-Gymnasium. The grounds of the Uni-Klinik Carl Gustav Carus were mapped via OSM and is now available as an app and online as routable accessible location map. The Overpass API v0.7.53 release comes with a bundle of useful improvements with changes in database and interface, coupled with other useful changes. Yves asks in the Dev mailing list, “Along with minutely diffs, I wonder if expired tiles lists would be something to be shared”. Andy Allan justified why that does not happen. Due to high load on the OSMF tile server, requests without HTTP-Referrer are considered as low-priority processes (that is too slow for interactive maps). This happens even if you include the tiles over HTTP on an HTTPS page,. Petr Pridall of Klokan Technologies, the project Tileserver GL. This is a tile server written in Node.js that uses Mapbox GL Native (C and OpenGL). The Irish Overpass API instance is back again. OSRM Backend 5.3.3 2016-09-01 Four bugfixes. E.g. crashes because of segfaults. … the list of OSM-based services? … the “OSM Truck QA Map – Missing maxheight tags in OpenStreetMap“? The corresponding wikipage has the details. IEEE Spectrum reports a new approach of the University of Texas to reach GPS centimeter accuracy with the help of ground stations. Arthur Brenaut has published on github a nice game to locate cities. The game has the potential for development. Network World shows a map by our competitor visualizing which countries in the world have open source laws. PlaneMad explains why the line on the ground given at the Greenwich Royal Observatory is about 100 metres off zero longitude today. An Icelandic tourist drew this map on the envelope instead of an address. The postal service delivered! This weekly was produced by Hakuch, Nakaner, Peda, Polyglot, Rogehm, SrrReal, YoViajo, derFred, jinalfoflia, kreuzschnabel.